Whether it’s drizzled over a thick juicy slice of prime rib, or served alongside a crunchy french roll piled high with tender slices of our famous roast beef, Charlie’s Pride Au Jus, Dipping Jus and Gravies have been expertly formulated to provide a mouth-watering finish to your perfect meal. Charlie's Pride has done all the prep work for you, so you just add the contents of our convenient foil packet to hot water, boil for a bit and you’ve got savory Beef Au Jus, zesty “Chicago Style” Italian Beef Gravy or spicy Cajun Au Jus in just minutes! We also have a flavorful Pastrami Dipping Jus to add a delicious new twist to your favorite deli sandwich. Use the recipes printed right on the packets, or visit our Recipes page for an extended variety of tantalizing sandwich suggestions and other creative menu ideas. 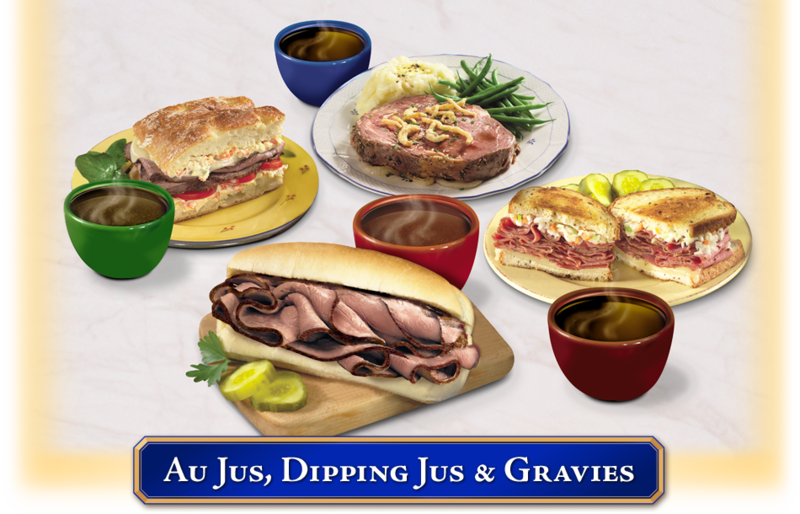 You can feel confident that you have chosen the world’s best Au Jus, Dipping Jus, and Gravies. Trans Fats, Artificial Flavors and MSG. Rich and savory beef-flavored Au Jus mingled with subtle seasonings, perfectly paired with Roast Beef, London Broil or Prime Rib. Available in a 1.06 oz retail packet (yields 3 cups), or a 2.8 oz foodservice pouch (yields ½ gallon). Rich beef-flavored Au Jus infused with spicy Cajun seasonings, best enjoyed with our sliced Cajun Style Roast Beef on a crusty french roll. Available in a 1.41 oz retail packet (yields 3 cups), or a 3.77 oz foodservice pouch (yields ½ gallon). Rich beef-flavored “Chicago Style” Gravy seasoned with traditional Italian herbs and spices; deliciously complements our sliced Italian Style Roast Beef on a hearty Italian loaf. Available in a 1.04 oz retail packet (yields 3 cups), or a 2.8 oz foodservice pouch (yields ½ gallon). Rich beef-flavored Dipping Jus combined with a unique blend of savory spices; deliciously complements the pride of Charlie’s Pastrami on your favorite rye bread or a crusty roll. Available in a 1.2 oz retail packet (yields 3 cups), or a 3.6 oz foodservice pouch (yields ½ gallon).